IMPORTANT! Use drop-down menu to select "30 days", then "click on Add to Cart"
IMPORTANT! This Kit is available by subscription ONLY!!! Please use dropdown menu to select frequency! Orders without subscription will be CANCELLED! Club La-La Land Crafts is a MONTHLY SUBSCRIPTION for EXCLUSIVE KITS from La-La Land Crafts! Each month you will receive a package containing an EXCLUSIVE Kit based on your choice of subscription plan! It will be automatically shipped to you by the end of each month. If you would like to see projects designed with the products from our past kits, please click HERE. 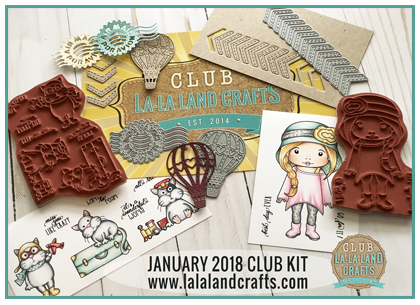 La-La Land Crafts products (stamps and dies) included in the Club Kits are NOT available for purchase outside of the Club until six months to one year after the Kit release. Monthly subscription plan is required. The Kit of the Month contents are revealed on the 16th of each month via live videos from our Design Team. Please join our Facebook Group HERE. Your billing cycle is based on the date your subscribe. After your initial first month payment for your first Kit, you will be charged on the 15th of the month starting with your second Kit. If you subscribe on or before the 17th, your subscription will start on the same month. If you subscribe after the 17th, your subscription will start on the following month. All Club Kits are shipped between 18th and 28th of each month via First Class Mail. IMPORTANT! We are NOT responsible for lost or stolen packages and there will be no refunds on the kits that are not received. IMPORTANT! We are NOT responsible for customs charges that you might be required to pay to your customs office. Past Kits are available for purchase starting with the second month of your Club subscription. One past kit per one month of subscription (based on availability). Please CONTACT US with your requests. Please make all changes no later than 15 days of your billing cycle to avoid interruption of your subscription plan. All Club Kits sales are final. No returns accepted. Cancellation must be made no later than 15 days before your next billing date. By subscribing to Club La-La Land Crafts you are agreeing to all of the terms and conditions outlined above. Love this kit! Quality is fantastic. Having fun giving Marci different colors of hair. Looking forward to more kits! Q: Can I cancel my subsciption at any time?